Samsung announced today that first-month sales of its Galaxy S8 and S8 Plus have reached 5 million units. Sales of the previous year's Galaxy S7 and S7 Edge sold an estimated 7-9 million units in their initial launch month, while back in 2013 Samsung announced its Galaxy S4 sold 10 million in its first month, a "Peak Galaxy" the company has never actually managed to surpass. A report by Cho Mu-Hyun for ZDNet noted the 5 million unit announcement, without any comparison to previous year sales. Each year since reaching Peak Galaxy in 2014, Samsung has floated the idea that its new model has outpaced sales, shipments (or sometimes "preorders") of the previous edition, but in reality Galaxy S sales--and subsequently Samsung Mobile profits--have actually never recovered since the Galaxy S4. An unnamed Samsung spokesperson stated that "although we cannot provide detailed figures, the sales are going smoothly around the globe. The combined sales already are beyond 5 million units." That language calls to mind the company's use of "quite smooth" to describe sales of the original Galaxy Tab back in 2011 (offered as a correction of "quite small" as initially reported). Years later, it was revealed in Samsung's iPhone infringement case that Galaxy Tab sales were indeed "quite small" and that the 2 million figure the company publicly announced shipping at the beginning of 2011 was twice as large as its actual sales for the entire year of 2011. 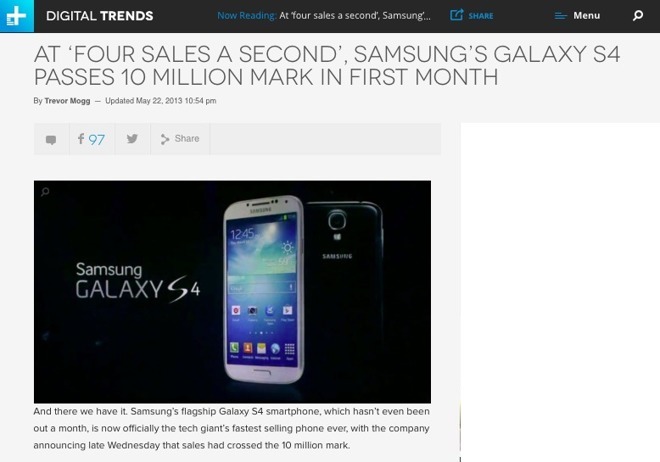 After announcing 10 million in first-month sales for Galaxy S4, a company spokesman the following year said Galaxy S5 sales had reached 11 million in its first month. The S5 turned out to be a poorly reviewed dog of a product, with a sloppily insecure fingerprint system that didn't work well. Sales tanked and profits fell, despite positive-sounding announcements of initial first month shipments. The following year, Information Week noted that Samsung's S6 and S6 Edge "failed to break records," citing that despite shipping 10 million S6 units into the channel, Counterpoint Research had estimated that it had only sold about 9 million —triple those of the S6 and S6 edge over the same period," according to Digital Trends. Yet if Samsung had sold 6 million S6 models the year before, triple that number would be 18 million, not 9 million, according to basic math. Last year, Vlad Savov wrote for the Verge that "Samsung's Galaxy S7 is outselling Apple's iPhone 6S in the US," citing data discovered in a comparison of the S7 launch and Apple's slowest quarter for sales. In reality, Apple's iPhone 6s sold 13 million units in 3 days at its launch, greater than three weeks of Samsung's S7 launch sales. 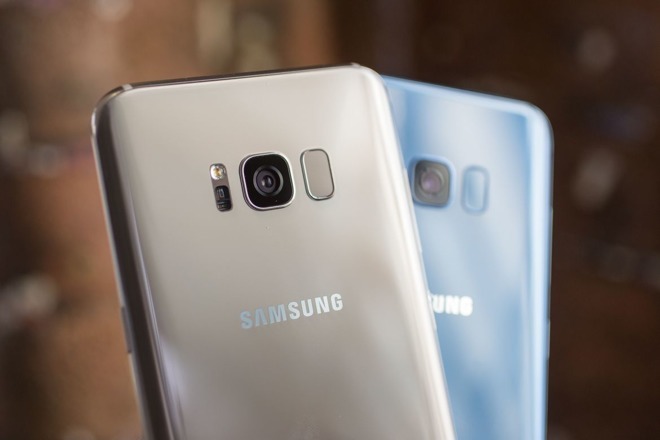 And rather than being real growth for Samsung, Counterpoint's research director Neil Shah estimated that the Galaxy S7 was only "on par with the popular S4 model," which launched four years ago between the introductions of iPhone 5 and 5s. Since then, Apple's sales grew dramatically in the shift from iPhone 5/5s generations to the larger 6/6s/7 models, while Samsung has remained stuck far below peak sales reached back in 2014. 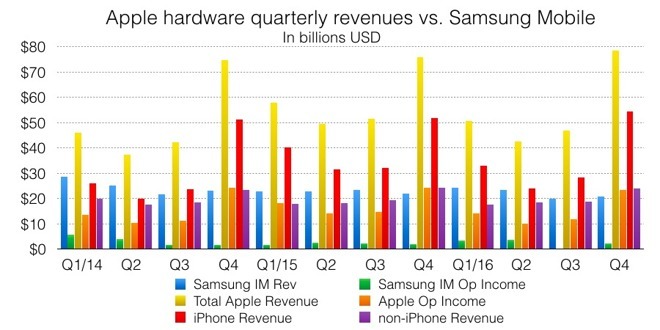 Apple continues to bring in over 5.4 times the profits of Samsung Mobile despite shipping fewer phone sets.